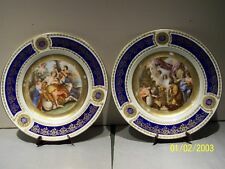 Antique Limoges Jean Pouyat France 13.25" x 12". Slightly Oval Platter. Platter can be Hung on the wall. PINK DROP ROSES GOLD TRIM. with Buy It Now Option. Perfect Condition, with no signs of wear. part of my Mother's Collections. Plate features a colonial era couple at center with lady holding a fan and man playing a flute. The inner border of plate is decorated with a turquoise blue band on a cream color background. Very good condition. Porcellana Souvenir. -Al contrario appena usuale segni di evidente usura. Heinrich Francese Piastra Fairy Tales 2 + Conf. Orig. : Der Pfauenkönig ( Int. Heinrich Francese Piastra Fairy Tales 2 Conf. : Der Pfauenkönig ( Int. Marke Heinrich Villeroy & Boch. 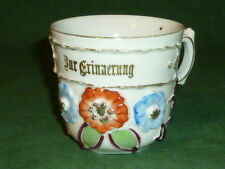 Marke & Herkunft Heinrich Villeroy & Boch. con più di 2.000 oggetti da collezione e grafici ). A causa della vecchiaia, condizioni immacolate (minimo chip sul bordo della Coppa). bella, compilazioni vecchioe, 1873 ! ROYAL COPENHAGEN. Il piatto di Natale del1969 è il62 ° della serie di famosi piatti Royal Copenhagen ed è intitolato “The Old Farmyard ”. Il piatto misura 18 cm. Può quindi presentare delle imperfezioni. *Vintage Collection * 7 Blue Ridge Hand Painted FRUIT Plates * 8.25"
Seven Southern Potteries Blue Ridge 8 1/4" luncheon /salad plates, all hand painted with various fruit designs. Condizione: Molto buono, con certificato e brochure. UPC Nicht zutreffend. Vintage Hamilton Collection Mystic Warriors Indian Native American 8 plate set. Condition is New. Shipped with USPS Parcel Select Ground. Off-white in color with gold trim that features tow fish on hooks connected by a chain. Full-color pictures are in fantastic condition! Minor imperfections on the back, believe to be from years on a plate hanger. Crown O Gold TRIM Vintage Arkansas Collector Plate HOT Eureka SPRINGS Cabin Etc. Some discoloring on yellow state and rubs on gold trim. In used/stored/displayed and or played with condition. Expect some signs of wear, dust/dirt in crevices, minor scratches, scuffs, scrapes, paint rubs, etc. Please look at my photos as they are part of the description and the camera can detect things I might have missed. Please check out my other listings. I do combine shipping when possible. Feel free to contact me with any questions. My home is nonsmoking but many of my items were purchased second hand and may have a slight odor but I will say in the description if there is a problem. My shipping materials are stored in wooden storage building and may have a musty/woody smell. 11x14 Silver Halide Photo Print. Each print is given a final inspection before leaving the studio. Isn't that the way it should be?. We really want to make you into one of our raving fans! Your Historic Photo Print Experts! DELFTS Blauw Chemkefa. Porcellana, maiolica dipinta diDELFT. in porcellana dipinta. Piatto da parete. Le sigle sul retro contengono una specificazione esatta della data. Noi riteniamo che il piatto possa risalire agli anni 60. MWW Market Mini Plates Winter SnowmEN Set Of 3. Nice set of three snowman winter svene plates. Ribbons attached for hanging. Measure 4.5" x 4.5" Excellent condition, no chips or cracks. Alogenuro d'argento 8x10 Photo Print. Lavoratori egiziani nel papavero da oppio campo del 1900. Iniziamo da trovare il file di negativo, stampa o digitale di qualità di massimo che è conosciuto per esistere. 11x14 Silver Halide Photo Print. Each print is given a final inspection before leaving the studio. Isn't that the way it should be?. We really want to make you into one of our raving fans! Vendor Slicing Cheese at First Avenue Market. This plate is the second plate from DeGrazia's Children of the Sun Collection. The plate is very colorful and displays well. The box has tape, writing and is a bit worn from age - but it still protects the plate well. Artists of the World DeGrazia "Spring Blossoms" Plate No. 796A 1987 in Original Box, COA & Plate Holder. This plate is the first limited-edition plate from DeGrazia's Children of the Sun Collection. The plate is very colorful and displays well. I haven't found a single plaque like this so it must be rare! Captain Janeway & The U.S.S. Voyager NCC-74656 Plate Power Of Command Hamilton. Condition is New. Shipped with USPS Priority Mail. This plate has been previously owned and is in fantastic condition. Actually, I just read that the mark was originally a shield but people referred to the mark as the “beehive”. This is a stunning 8-1/2” plate with a scalloped rim with gold trim. The border is a cool pink color with raised gold roses and foliage vining through the border. 1988 Baseball Cards. Official Complete Set. Cards were reviewed for Condition Only. Not for Value, Misprints, Errors, or Duplicates. It's deep yellow with a picture of a girl writing on a chalkboard. Includes "Turn Back The Clock" Cards. 1987 Baseball Cards. Official Complete Set. Not for Value, Rookie Cards, Misprints, Errors, or Duplicates. Cards were reviewed for Condition Only. Very Good to Excellent Ungraded Condition. 792 Cards including "Turn Back The Clock" Cards. 1986 Baseball Cards. Official Complete Set. Not for Value, Rookie Cards, Misprints, Errors, or Duplicates. with 1961 Roger Marris & Pete Rose Years set.